Quotation for Drip system under the project of “Promoting Cactus (Opuntiaficus-inica) as drought Resilient Feed Resource under Different Agro-Ecological Production System Across India” at RRS,CAZRI, Bhuj. 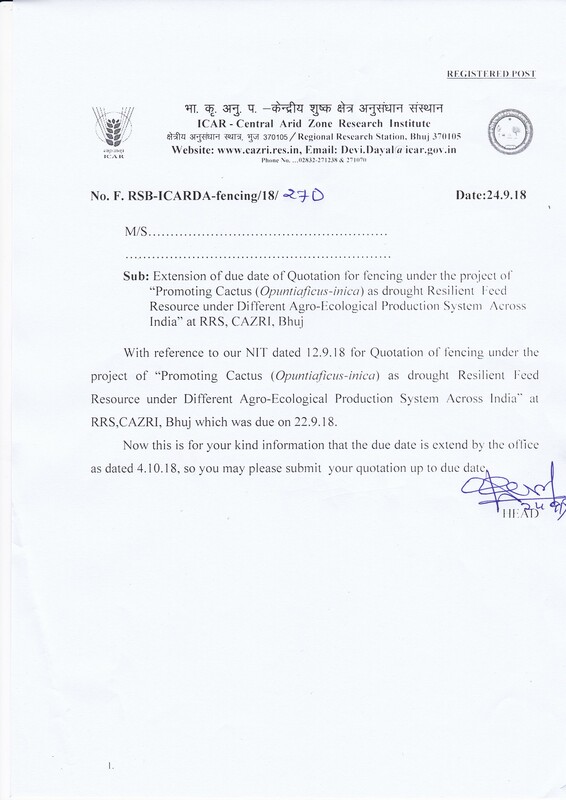 Extension Notice:- E-tender for Annual Rate Contract for carrying out the work of Animal Shed Management at ICAR-CAZRI, REGIONALRESEARCH STATION, BIKANER 334 004 RAJASTHAN -regd. E-tender for Annual Rate Contract for carrying out the work for providing of chowkidars/watchmen without arms for ICAR-CAZRI, REGIONAL RESEARCH STATION, BIKANER 334 004 RAJASTHAN -regd. E-tender for Annual Rate Contract for carrying out the work of Animal Sheed Management at ICAR-CAZRI, REGIONAL RESEARCH STATION, BIKANER 334 004 RAJASTHAN -regd. E-Tender for Annual Rate Contract for Hiring of Tipper at ICAR-CAZRI – RRS, LEH (J&K) -regd. NIT for Hiring of Tent Pandal, Stage, Electrical and Sound system etc. Annual Rate Contract for engagement of agency for carrying out of farm /tech/lab work at ICAR-CAZRI, RRS, Pali-regd. Tender for Farming on Share Basis at ICAR – CAZRI’S RRS, Bikaner- regd. E-tender for Annual Rate Contract for maintenance/repair of Air Conditioners for 2018-19 at ICAR-CAZRI, Jodhpur -regd. E-tender for Annual Rate Contract for carrying out the cleaning work at ICAR-CAZRI, Jodhpur -regd. Extension Notice :- E-tender for Annual Rate Contract for Carrying out of Whitewashing,Distempering, Painting and Minor repairs & maintenance of CAZRI,Jodhpur -regd. E-tender for Annual Rate Contract for preparation and maintenance of saplings of fruit trees on under ICAR-MEGA SEED and KVK Revolving fund at ICAR-CAZRI, Jodhpur on outsourcing basis -regd. Quotation for supply of Cement Bags, Stones (Sur Sagar Stone), Mungia and Bajri at Popawas Panchayat. Quotation for Supply of Cement bags, Stones(Sur Sagar Stone), Mungia and Bajri at Popawas Panchayat,village Popawas District- Jodhpur. E-tender for Annual Rate Contract for Hiring of JCB at ICAR-CAZRI – RRS, LEH (J&K) -regd. E-tender for Annual Rate Contract for Engagement of Agency for providing manpower at ICAR-CAZRI, RRS, Leh (J&K) on outsourcing basis -regd. Inviting Quotations for Purchase of Precision Weighing Balance. E-tender for Annual Rate Contract for Engagement of Agency for carrying out of cleaning work at ICAR-CAZRI’S RRS Pali on outsourcing basis under Annual Rate Contract-regd. E-Tender for Annual Rate Contract for Engagement of Agency for providing gency Security Services at ICAR –CAZRI’s- RRS, Bhuj on outsourcing basis – regd. E-tender for Annual Rate Contract for the purchase of Chemicals at ICAR-CAZRI, Jodhpur -regd. E-tender for Annual Rate Contract for engagement of agency for carrying out Electric Maintenance & Repair work at ICAR-CAZRI, Jodhpur on outsourcing basis -regd.